Social sharing site Pinterest has grown to 12 million users and sparked a new surge in social marketing. 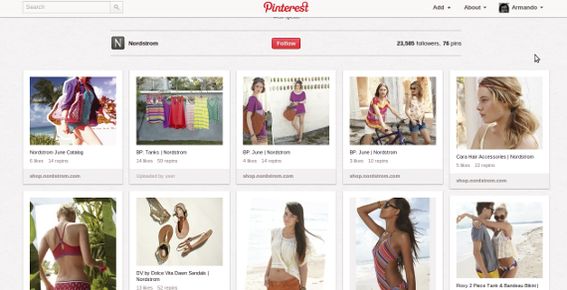 Some online businesses are hoping to use Pinterest as a way to engage customers and make sales. As with any form of marketing there are some best practices that may make a business’ efforts more efficient and effective. What follows are seven tips for improving your business’s Pinterest marketing. Pinterest lets users save pictures and videos to topical boards. These pin boards may be thought of as a form of customer segmentation, since Pinterest users may follow individual boards. Folks that click from the Bake It board and arrive at the Michael’s site have segmented themselves, and Michael’s would be wise to use that information to further engage, perhaps offering a special discount for joining the baking email list or similar, or showing different on-site merchandising based on which pin board a visitor came form. Michael’s uses its Pinterest boards to segment followers. In some sense, social sharing is an extremely fast moving medium. Topics and fashions come into and go out of popularity very quickly. When marketing on Pinterest, be a trendy pinner — meaning that the images and videos posted reflect what a business’s potential customers are talking about. For example, the 2012 Olympics are just getting started in London. Pinning images that relate to the Olympic games could be one way of giving Pinterest marketing a boost. 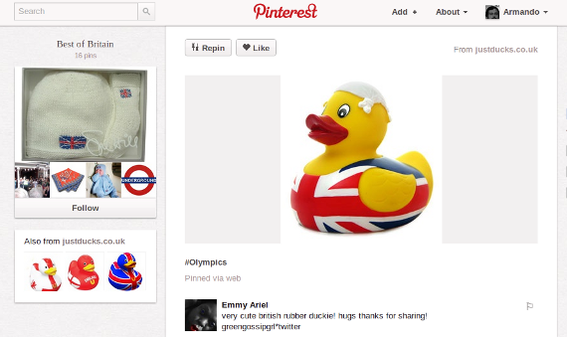 An Olympic-inspired rubber duck was pinned during the London games, potentially boosting sales. 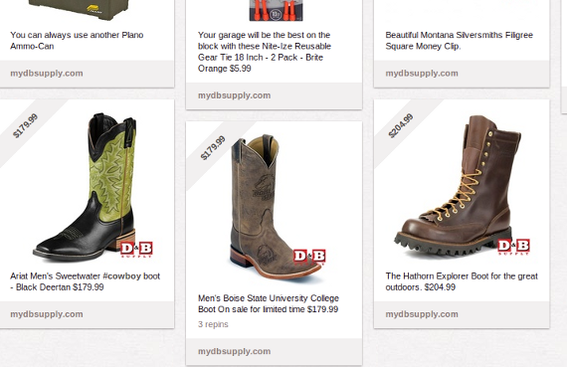 Pinterest is like a gigantic wish list on which users pin product picture after product picture. As such it can be a great place for online retailers to simply display their wares. Nordstrom, for instance, has published many of its catalog images on Pinterest, and the company regularly pins new products or offers. Retailers like Nordstrom are not shy about pinning product pictures. This tip is a bit more controversial — see the opposite suggestion on the Econsultancy site — but if the ultimate goal is to close what some marketers call the “purchase gap” and get someone to actually purchase an item and not just share pictures of it, the price clearly indicated that an item is for sale. This is another suggestion that only applies to Pinterest or similar pinning sites. Displaying an item’s price shows that a merchant means business. Pinterest marketing should include interacting with other site users. This means that marketers should regularly search the Pinterest site looking for material related to the retailer’s industry segment. 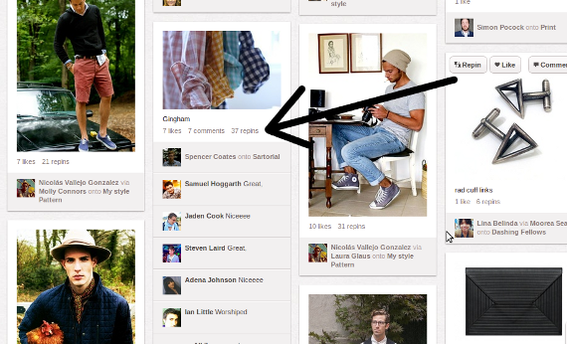 When something interesting and relevant is discovered, repin it giving credit to the original pinner. It can also be very effective to engage other users directly with comments and follows. On Pinterest commenting and repinning are engagement. Photographs dominate Pinterest’s content. 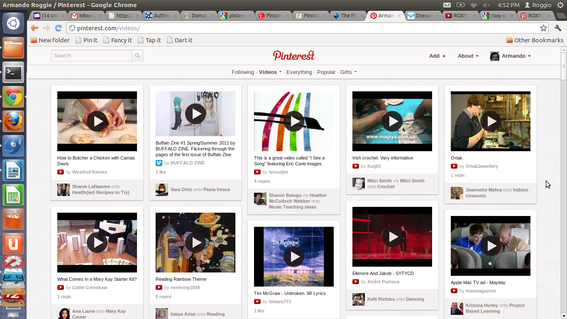 But remember that Pinterest supports pinning videos too. Posting relevant and interesting videos can be a great way to garner engagement. As an example, clothing company Roxy has some excellent video content, including fashion videos, surfing videos, and snowboarding videos. All of these would be great for Pinterest. Videos make for great Pinterest pins. In the U.S., between 68.2 percent and 90 percent of Pinterest users are women. This means that Pinterest will probably work best for merchants with products aimed at females. Perhaps 28 percent of Pinterest users have an annual income in excess of $100,000, and it is estimated that more than half of all Pinterest users have children. About half of the site’s users are between 25 and 44 years old. Some 17 percent of the site’s visitors are between 18 and 25. A merchant should consider whether or not its customers are likely to be using Pinterest, before investing a lot of resources into marketing on this site. It may also be the case that there are other similar sites that offer a better demographic for some businesses.